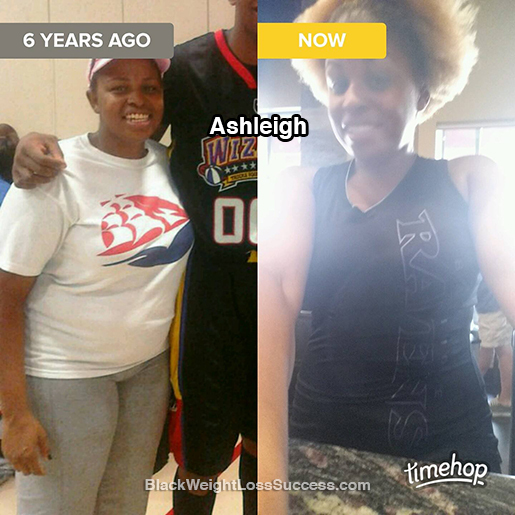 Transformation of the Day: Ashleigh lost 48 pounds. After a wake up call at the doctor’s office, she immediately took action to turn her lifestyle around. She wanted to be healthy and comfortable in her own skin so she took the time to figure out what works for her. “Just because something works for someone else does not mean it will work for you. 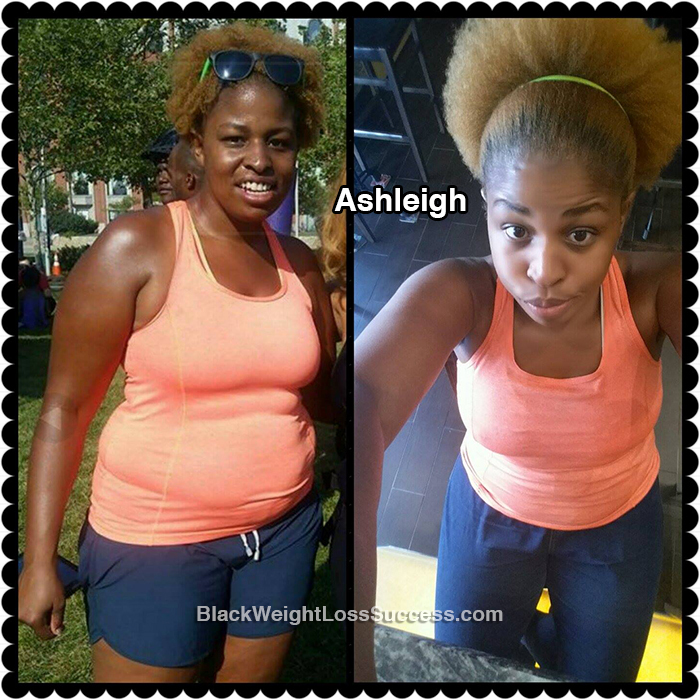 Try different things and pick what works best for you and your lifestyle.” Check out her story. While in grad school, I had a physical. I had gained a lot of weight, reaching my highest weight at 246 pounds. My doctor did a complete blood work up, as he thought something medical was wrong. When nothing was medically wrong, my doctor told me I was just fat and needed to do something about it. That was my motivation. At that very moment, I made a post online, looking for a running partner, as I ran in high school and that was a form of exercise that was familiar to me. I made a post on twitter and began running with a friend. My motivation to continue was not feeling comfortable in my own skin, not being able to wear the clothes I was use to wearing, hating to shop at all and the overall desire to be healthy. My eating habits have been all over the place. I have done the JJ Smith smoothie diet, the Joe Cross Juice Cleanse, Herbalife and Plexus. What worked best for me was cutting out one thing at a time. I found that when I tried to cut everything out all at once I would end up binge eating. I am at a point now where I eat mostly organic, but when I crave items like fried chicken I eat it. Now, instead of eating 6 wings, fries and a half and half I will eat 3 wings, salad and water. I do not eat at any fast food restaurants EVER. I workout 5-6 days a week and I am always changing it up. I run, do spin classes, personal training, dance classes or elliptical. I find for me that changing it up often works best because it keeps it fun. I started my journey in 2012, four years later I am down to 198 lbs. Over the years, I have lost weight, found it and regained it back. I am finally at a point of a steady decrease. I would still like to lose another 25-30 pounds so check back with me January-ish of 2017!! Do not look at this a diet, but rather a lifestyle change. When you are starting out, do not share with people what you are doing because judgment from other people makes it hard. If someone offers you something and it is something you are choosing not to eat, just tell them no thank you. Know that you do not have to explain yourself. Also, please note that not everything works for everyone. Just because something works for someone else does not mean it will work for you. Try different things and pick what works best for you and your lifestyle. Be as consistent as possible and NEVER give up! Do not be hard on yourself either. Remember, slow progress is better than no progress. Amazing progress – a bit jealous & so Inspired!!!!! Will try to remember what you’ve said about not having to explain yourself. You look like your baby sister – years younger. AMAZING!!! You are so right about not letting people know what you are doing and how you are losing weight. I let people who were smaller than me tell me not to drink protein and only do cardio etc. By listening to them I fell off the bandwagon. You’ve shown me that finding your own path to health that fits your own lifestyle is the best way. Thank you for sharing your story!